Home › White-cheeked partridge › Koklass pheasant - Pucrasia macrolopha. 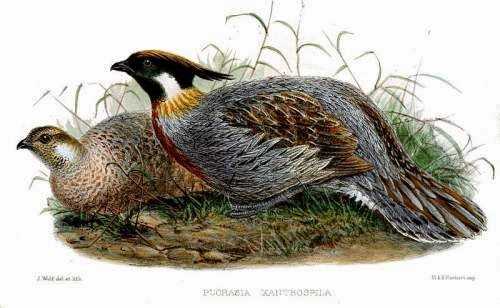 The koklass pheasant (Pucrasia macrolopha) belongs to the Pheasant family, the Phasianidae. The koklass pheasants are distributed in Afghanistan, Pakistan, India, Nepal, China and Mongolia. There are nine recognized subspecies of these birds. They are, P. m. castanea, P. m. biddulphi, P. m. macrolopha, P. m. nipalensis, P. m. meyeri, P. m. ruficollis, P. m. xanthospila, P. m. joretiana and P. m. darwini. The subspecies P. m. biddulphi and P. m. macrolopha occur in India. The International Union for Conservation of Nature (IUCN) had categorized and evaluated these pheasant species and had listed them as of 'Least Concern'. These pheasants are medium sized birds, measuring 55 to 65 cm in length and weighing 900 to 1400 grams. The males are larger and colorful birds. The back of koklass pheasant is covered with silver grey feathers. Their head is black and the breast is chestnut in color. They have white patches on the cheeks. The tail is elongated. These birds inhabit coniferous and mixed forests. They are seen in steep slopes at 2,000 meters and above. They feed on seeds, insects and berries. They are believed to breed during April to June. Current topic in Birds of India: Koklass pheasant - Pucrasia macrolopha.